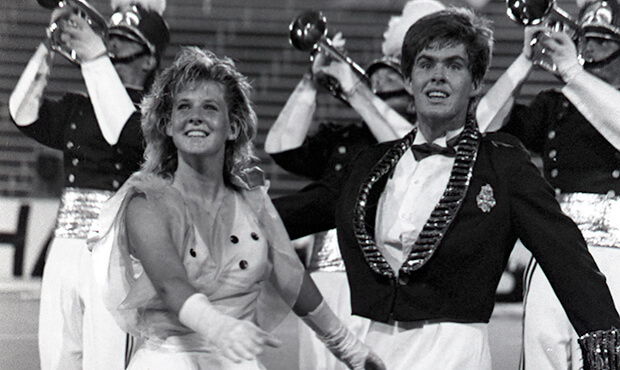 The 1987 Drum Corps International World Championships in Madison was the first time DCI had ever gone to the same city and stadium three years in a row. Garfield Cadets edged Santa Clara Vanguard by just a tenth of a point for the title, with SCV only losing the last two shows of the summer. Early in the season, Cadets lost three times to Spirit of Atlanta, a corps that was to finish the season in 10th place. The top two positions weren't the only ones that were tight in the Finals competition: Only four tenths separated third from fifth place and sixth from the tie for seventh. In placing fourth, Blue Devils snapped their streak of placing in the top-three and winning at least one caption at Finals, which had stood since 1976. But while one "blue" corps hit a temporary dip in the competitive landscape, another, the Bluecoats, made the Finals for the first time. Among the highlights of 1987, Garfield Cadets' "Appalachian Spring" featured a professional dancer, and the corps' quiet backfield exit caused lots of fans to "shush" those next to them. SCV's Russian show was one of the closest we've ever had to a Cecil B. DeMille costumed spectacular, and Phantom Regiment glistened with its new "White Ballet" uniforms. Of the two corps that tied for seventh, Star of Indiana featured jugglers and a magician, and Velvet Knights embarked on the first of its popular series of "Magical Mystery Tour" shows. Bluecoats became instantly loved with a drum break that kept adding more and more snare drummers, and Sky Ryders' "West Side Story" show took a literal approach, with the corps split up as two opposing gangs in two different colors. In ninth place, Suncoast Sound presented "My Fair Lady…Our Way!," featuring the music of the 1956 smash theatrical hit by composer Frederick Loewe and lyricist Alan Jay Lerner. At the time, the musical set the record for the longest run on Broadway. "My Fair Lady" followed the storyline written by George Bernard Shaw in his play, "Pygmalion," a social commentary about the British class system masqueraded as a romantic comedy about a phonetics professor working with an English commoner in order to get her to sound like and pass for a socially cultured duchess. Discount DVD offer ends Monday, Nov. 5 at 8:30 a.m. ET.